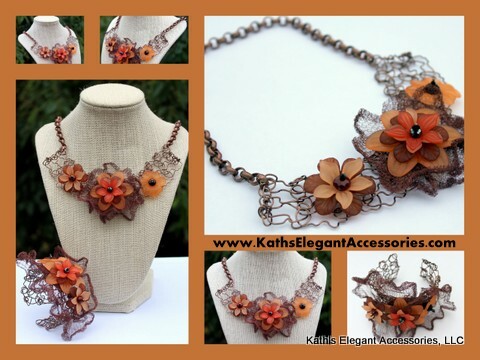 Kathy’s Stunning Statement Necklace and Cuff of Lucite Flowers in Pantone’s Fall Color Palette of Tangerine Tango, French Roast and Honey Gold featuring WireKnitZ® Embellishments. 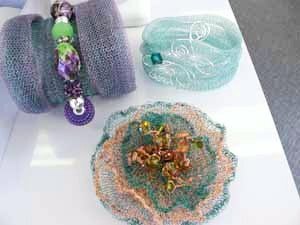 Kathy Messick from Occoquan, VA taught herself how to knit with wire to create jewelry in 2006. While helping take care of her mother during her losing battle with pancreatic cancer, Kathy’s family and friends were so supportive; she decided to name select pieces in her jewelry line in their honor. Naturally, the first piece she created (rose quartz, sea shells and pearls on silver wire) was named after her late Mother, Sarah. 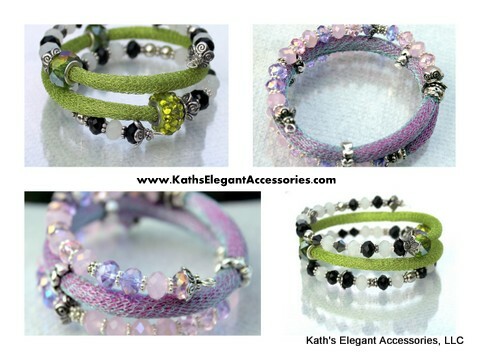 Kathy credits her local bead store, Off the Beading Path , Occoquan, VA, for introducing her to WireKnitZ® products this summer and she has enjoyed incorporating WireKnitZ® into her latest designs. In January of this year, Kathy was represented by The Artisan Group at the 2012 GBK Gift Lounge where one of her signature necklaces was on display; celebrity gift lounges give artisans the opportunity to get their products in the hands of today’s leading trend-setters. 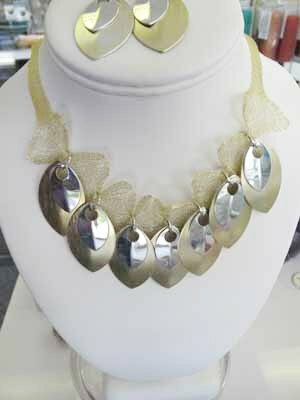 Kath’s Elegant Accessories wire knitted pendants were also gifted to celebrities and members of the press at this event. Participation in GBK Gift Lounges for 2011 Primetime Emmys, 2012 Golden Globes, Oscars and The MTV Movie Awards. Celebrity Mother’s Day Gift Bags and Charitable Donations provided for a variety of charities. 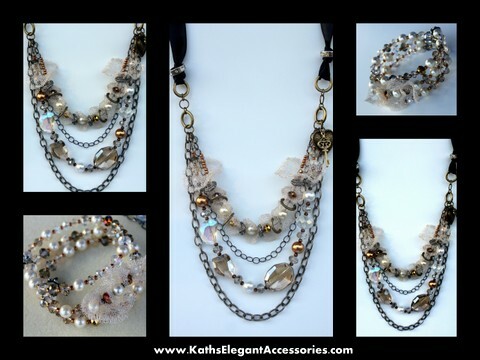 http://www.KathsElegantAccessories.com & find her on https://www.facebook.com/KathsElegantAccessories too. Thanks for sharing, Kathy; we look forward to your next chapter! 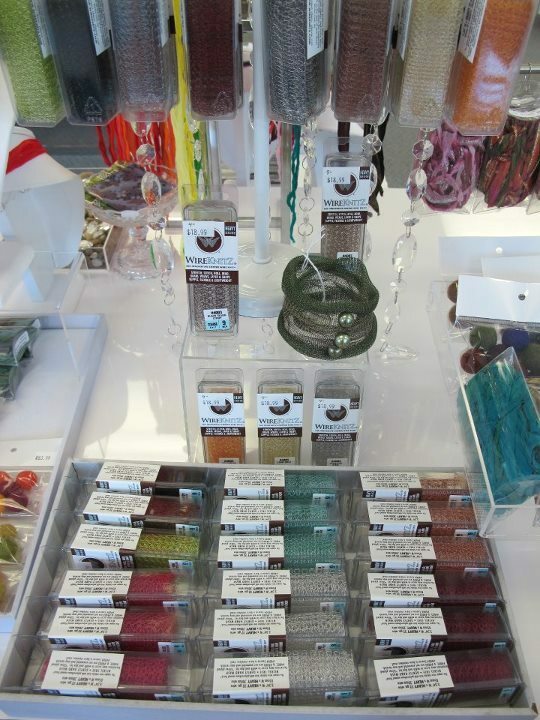 We are so happy to welcome That Bead Lady in Newmarket, ON, as our first Canadian merchant! 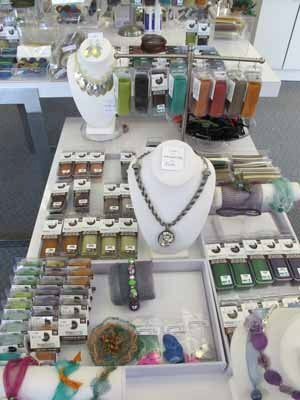 Recognized for offering the latest in new and unusual materials and developing cutting edge designs, That Bead Lady is also known for beautifully displaying their many inspirational finished designs. The experienced staff is always willing to share their knowledge and many skills and has demonstrated WireKnitZ® on several occasions; they are currently developing new WireKnitZ® designs and will offer classes this fall. 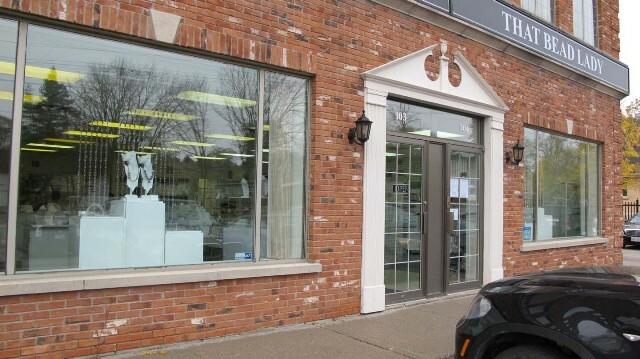 Now our Canadian customers have a shop they can visit to experience the tactile qualities and get to know and understand the five Series of WireKnitZ®, or place your order by calling That Bead Lady at 905.954.1327. 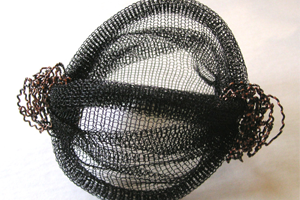 Find WireKnitZ® with the fibers…after all, it is a textile! Cathy Lampole, the owner of That Bead Lady, decided to turn her experience in needle arts into an online bead store featuring beading kits of her own designs in 1996…a real e-commerce pioneer! 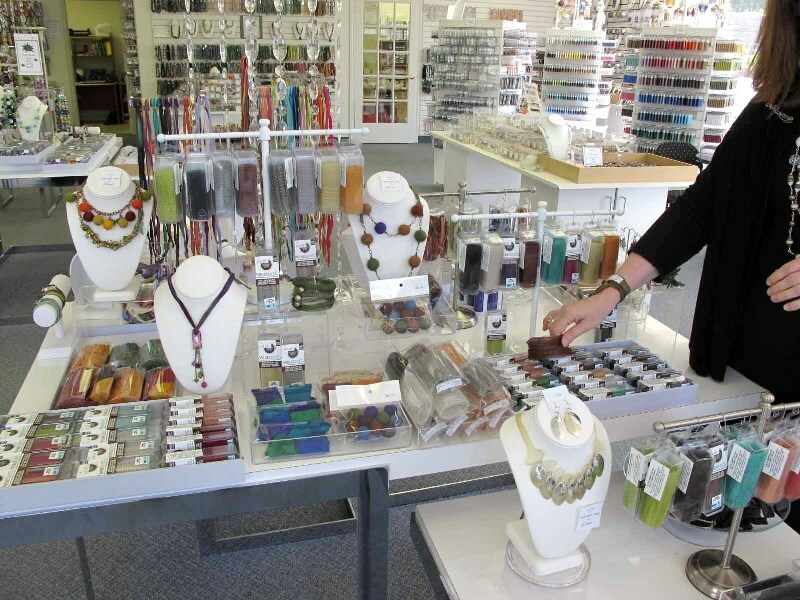 In 2004, after several years of exhibiting and growing her business, Cathy knew it was time to open a bead store in Newmarket, ON, and develop That Bead Lady into the premier shop for beads in the province. In fact, That Bead Lady was voted one of the best bead shops by a Lark Crafts survey conducted earlier this year! Cathy has an in-depth knowledge of all seed bead colors and is an expert in selecting beautiful combinations! A well-known figure in the beading world, with articles appearing in a variety of beading publications; Cathy is also a frequent contributor to Bead and Button magazine. Alison Layton, store manager and teacher, is known for her perfectly wrapped wire loops and many exquisitely beaded shop designs and is knowledgeable of stones and their healing properties. Marilyn Parker, teacher, is a beading expert in all variations of seed bead work, and a leading member in the Toronto Bead Society. Stephanie Dixon, Swarovski Ambassador and teacher, (a.k.a. The Dixon Chick) is an avid crocheter and a well known designer specializing in wire techniques and creating pieces that give instant gratification. Stephanie loves teaching students new techniques. Visit www.thatbeadlady.com for classes, kits, and inspiration. Cathy predicts it’s going to be a fiber fall! 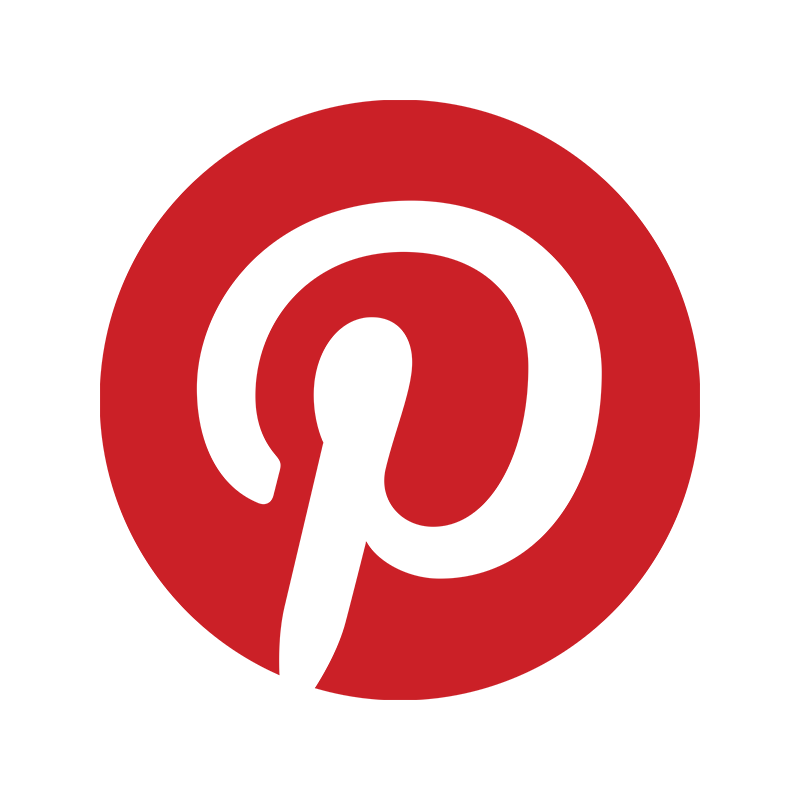 Please support our merchants by sharing the newZ with your design buddies… Thank you for forwarding!